Originally hailing from Strawberry Junction, Texas, Jordan Rousseau received his MFA in Technical Production from the University of North Carolina at Chapel Hill, and his BA in Oral Communication/Theatre from Harding University in Searcy, Arkansas. He is a Technical Director in charge of behind-the-scenes safety, logistics, and construction. He is also the Properties Department mentor and supervisor, and can be found working in the basement on various animal puppets and fine furniture. Jordan's experience includes working for the National Theatre in London, PlayMaker’s Repertory Company (LORT D), The Virginia Shakespeare Festival, The University of North Carolina at Chapel Hill, The Carrboro Arts Festival, Creative Visions, Searcy Summer Dinner Theatre, Waco’s Children Theatre, as well as many consultant jobs for various high schools and theatre companies. Some of his recent projects have included special properties construction for Dallas Shakespeare's The Tempest, design and creation of the deer for the world premiere of Deer at Stage West, and special effects fabrication for Common and Barbershop Chronicals at the National Theatre in London. 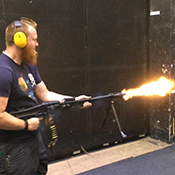 Jordan is also a licensed pyro-technician and special effects operator. He loves blowing things up and setting himself on fire. You can often see him on the sidelines at Baylor football and basketball games getting ready to make a spectacle. Jordan specializes in props construction, metal fabrication, rigging, special effects, and CNC operations. Jordan is happily married to Kaity Briscoe, who works as the Fine Arts-LLC Program Director for Baylor. They are the proud parents of two rescue dogs — .22 and Kimber. Jordan loves photography, wearing kilts, and science.